On January 30, 2014 the Minister of Defence of the Republic of Azerbaijan Mr. Zakir Hasanov and the Ambassador of the Republic of Serbia Mr. Zoran Vajovic had a meeting and talked about the developing bilateral military cooperation between Serbia and Azerbaijan, the military-political situation in the region and the Armenian-Azerbaijani Nagorno-Karabakh conflict. 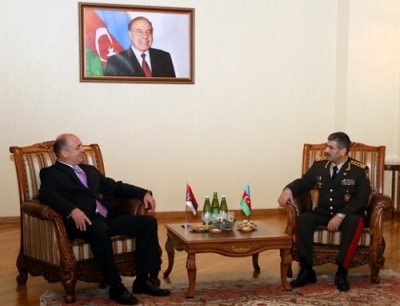 Colonel-General Zakir Hasanov expressed his gratitude to Ambassador for the support in resolving the conflict in accordance with international law and relevant resolutions of the UN Security Council. Ambassador Zoran Vajovic stressed the importance of strategic cooperation between the two countries, the existence of friendly relations and noticed that Serbia will always support the sovereignty and territorial integrity of the Republic of Azerbaijan.